1:50:00 AM who said they were extinct? 1:10:00 PM Just wanted to verify that these guys are NOT extinct. I just found a spawn on the Corbantis server yesterday and another one today. 3:29:00 PM When I got mine, it was a lairless spawn with 1 adult. I killed that adult and 3 more after her before a baby appeared. 11:08:00 AM I found a swamp stalker today but no babies, do they have lairs or are they solitary hunters and you have to kill and then wait for a baby to spawn? 9:20:00 PM Last saturday I went to Naboo to give my friend a black devil gulg i tamed for him. I decided well since im here ill go look for swamp stalkers. It was odd though I found 2 spawns of them at different WPs I have. On the 4/4 one in the second spawn it killed me.. :( BUT when i was leaving keren to go back to the spawn ... a swampie was about 500m from keren in the feild. So i killed the first 3. And the forth spawns a massive gnort in the spot so i figure that I didnt get one when all of a sudden a baby spawned. I was cheering out loud when i tamed it on my 2nd try. It was white as can be but it had 9.3k ham. So i decided to head back to the spawn that killed me and when i got there it respawned so i killed the first and right away the second was a baby. I tamed it on my second try. It was dark grey with a white tail. I love them They work so well together. I named them Myth and Legend and each have different personalitys. Awsome. 1:41:00 PM I usually just avoid these, since a CDEF pistol isn't the best weapon to take them down. I decided to try my luck anyway, and called a pet. after two kills, I wasn't expecting much. I waited patiently for the third spawn. minutes passed, and I figured I was done. I started walking off, and sure enough, a baby had spawned just out of range. took three tries, but it's in the datapad. now I can get picky about the color, and start looking for more. 10:12:00 AM I was searching for one when I see an adult. I get off of my bike about 20m away only to find another spawn right next to it! So I had two spawns very close and was feeling pretty good about my chances. I decide to go for 1 spawn at the time and start killing the adults. 1 down... 2 down... 3 down... Oh no! Other spawn poofed! I wait for last spawn but it's an adult. :( While fighting it I see a red dot pop out again: the other spawn is back! After I finished the first spawn, I kill 2 other adults and then a little baby appears. Tamed it on the first try. 2:33:00 AM Wow i was looking on and off for these dudes along with the great plains stalker. Found 2 spawns SW of keren in the 6 weeks.. no baby spanwed from eather. I wish i could get 2 since you can take them both out that would be sweet! 10:14:00 PM I have an exact pair like Graxo. One is silver/ white, other is dark brown/black. Both have 9.3 HAM. When they are both laying side by side after a "pet". they are very impressive. Clearing spawns worked for me, just the spawns without lairs, like Rogue Fambaas, lone peko pekos, rogue Falmpausts,(sp) etc. All the swampy areas SW of Kern is where I found them all. Good luck! Actually, I had to hunt them a lot longer than my GPS. Almost ashamed to say it, but the 1st spawn I found of Greater plains Stalker, 3rd pop was a baby. Freaking unreal luck I know, but I am glad to have him. Hardest part of that tame was to keep it alive as it kept charging into a nearby nest of defenders. Good luck all and I am on Kettermoor name of Packa if anyone wants to look for swampies or GPS, give me a holler. 5:51:00 PM Ive found 3 spawns of these in the last 2 days and all 3 spawned 4 adults. I guess ill keep on lookin. 2:23:00 AM Congratulations! But honestly I think it really doesn't matter what the HAM is. Mine is 9.3K but it's the fact that I have one and I think it is neat they are different color schemes. 10:02:00 PM am on the chilastra server if anyone has spawn waypoints on this server i would greatly appreciate it!! 9:53:00 AM hi guys...my first post :) im master CH on chimaera server and have been searching for wamp stalkers for about 2 months with no luck....but in the last 4 days ive tamed 2...one silver/white one dark grey both have 9.3k HAM and were found in the usual spot people look SW of keren.it really is just a case of being patient and taking out the single adult spawns..eventually you'll get em.good luck. 9:58:00 PM Jolee, I believe all Swamp Stalkers are 'silver' but as for the HAM, is this what you saw in the wild or in your datapad after it has been tamed? When you tame it, it's HAM drops, as with most Creatures in the Wild. 11:45:00 AM I'm going crazy trying to find these! If someone is on the Bria server and you have a verified WP to a spawn of these fellas please try to send it to Lupowop via e-mail. I've been hunting these fellas and only once ran across one adult. i have searched within a 1000M radius of all the provided spawns and nothing, no adults, no babies...nothing...please help!! 3:09:00 PM Hiya Wolvy, The strategy that I used isn't going to guarantee a Swamp Stalker every time you clear a lone spawn mob's cycle because the Stalker itself is quite rare. I killed over 30 adults in a period of several weeks of searching and it was probably a month after that I started this technique and found it to work for me. The lone spawn mobs seem to vary quite a bit with each server reset. Some people have gotten lucky in finding a Stalker in one day, others it took weeks. Not sure what else to tell you except that since Stalkers have no lairs the only way they'll spawn is by clearing the place holders that already exist. Hope that helps. 4:27:00 PM Yes, that looks better. Gonna try and find a pair of tehse this weekend. 6:50:00 PM That HAM can NOT be correct. You've given it more than a Bull Rancor... anyone care to fix this? 2:13:00 PM Probably not, these are a little more common than a GPS. 7:30:00 AM do these sell for 5 mill like some of the gps babies. 12:21:00 PM Tamed a baby on my first outing for these. I killed 3 adult spawns before the baby came out. Whew I was expecting another long search for this one, but I guess I got lucky. 4:06:00 PM Tamed by baby yesterday morning in the swamps SE of Keren. Ran around the waypoints for a few hours feeling lucky, and a saw 3 spawns. The 2nd supplied a baby. The adults WILL aggro anything in range and not maskscent(ed) when they pop, so make sure you have a pet out or a dumb TK mate to distract... Good luck to anyone looking. 10:21:00 AM I live just East of Moenia and my house is right on top of Swamp Stalker spawn spot. I see them often and I kill them whenever I see them, but never seen a baby spawn. Maybe SW of Karen is THE spot as I see all of you guys tame one there. 11:39:00 AM I have 2 Swamp Stalkers now (would have had 3 but I had a double spawn of Stalkers in the same area and an adult killed the nearby baby as soon as it spawn grr). Tamed them both in the swamps SW of Keren. They're basically triggered by consistantly killing off all of the random one spawn mobs 4 times or so like Rogue Fambaas, Narglatches, Peko Pekos etc. Any time you see a lone spawn mob there's a good chance that by killing off it's entire spawn cycle that a Swamp Stalker could respawn as it's replacement. That's been my experience at least. I wish these cats didn't attack the first thing they see like GPS's do when you call them lol. Hope that helps and good luck! 10:17:00 PM Tamed fist Swamp Stalker SW of Keren. This was my first try looking for them. Killed two adults before baby spawned. 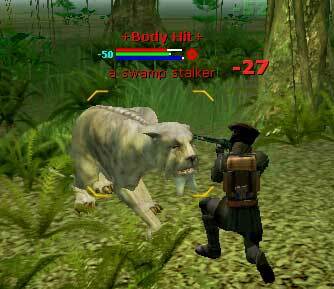 11:59:00 AM I've killed over 30 Swamp Stalker adults, mostly in the swamps SW of Keren, but have yet to find a baby. I found and tamed a Great Plains Stalker in less time than finding a baby of this mob. Perhaps I've just been unlucky. Just curious to those that have tamed one, how many adults did you kill before you happened upon a baby? 2:44:00 PM Yup, I saw one around Moena last night 3/3/04 and it was alone no lairs around. I circled him a couple of times just to look at his HAM....I think it was 10k as opposed to high 9k. I guess the stats on the beasts can vary to a certain degree. 1:34:00 PM updated for more accurate ham listing based on baby data, sighting location, and bone type. 10:13:00 AM DOES have babies, tamed one approx. 1/28/04. Appears to spawn in much the same fashion as a GPS, i.e., signle creature per spawn, no lairs. 12:01:00 PM This cat attacks most things it spots, it attacked my pet while it was 40m away.